Ellen Stirling was born Ellen Mangles in 1807 in Guildford, England. The youngest daughter of James and Mary, Ellen grew up on a large family property called ‘Woodbridge’ with her eleven brothers and sisters. The Mangles family had acquired significant wealth through successful banking and shipping investments, ensuring the highest standards of education for their children. At thirteen, Ellen’s cousin invited James Stirling to meet his relatives at Woodbridge. It is said that when Stirling drove his carriage from the gates to the house, he narrowly missed hitting a girl riding two donkeys, one foot planted on the back of each. This adventurous girl was Ellen, who in less than three years would become Stirling’s wife. When Stirling asked Ellen’s parents for her hand in marriage, they were hardly surprised. Over the previous year, they had closely observed his growing attachment to their young daughter. Her mother, who described him as a 'very domestic, prudent and steady… and really a most gentlemanly, elegant young man', was most happy to receive his request. It was agreed that Ellen would be informed of the proposal at the completion of her schooling, but when Stirling’s father passed away less than six months later, her parents allowed the marriage to go ahead that year. 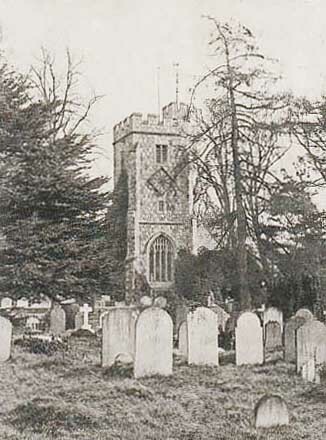 On Ellen’s sixteenth birthday, she married James Stirling at Stoke Church, Guildford. Between 1826-1845 Ellen Stirling had eleven children: Andrew Frederick, Frederick Henry, William, Mary, Charles Edward, Agnes, Walter Albert, Ellinor, Anna Hamilton, Dorathea and Georgina Janet. After the wedding, the couple spent time travelling through Europe before returning home to Woodbridge. Only a few months later, Ellen gave birth to the first of her eleven children, Andrew, on 24 October 1824. In 1826, James Stirling took command of the ship, Success, and headed for Sydney. On reports of French activity in the Pacific, his duty was to relocate the Melville Island garrison to a more strategic location. However, on surveying the west coast, he saw the potential for trade and convinced the governor of NSW, Ralph Darling, to support the development of a new colony. After some delay, the British Government approved Stirling’s plan and in 1928 appointed him Lieutenent-Governor of the Swan River settlement. James Stirling’s title of Lieutenant-Governor was officially upgraded to Governor in November 1831. For Ellen, the prospect of establishing a life in the new colony was exciting, but she was also anxious about the journey. Heavily pregnant and due to give birth in less than six weeks, she boarded the storeship Parmelia with her husband and son on 24 January 1829. En route to the Cape of Good Hope, Ellen gave birth to her second child, Frederick, and for the next two months nursed her new baby in the confines of a small cabin. The right stone was not found in time for the celebration so a she-oak was cut down to mark Foundation Day. Timber from the tree was later crafted into an elegant sewing box and presented to Lady Stirling as a memento of the occasion. On the 12th of August the anniversary of the day on which His Gracious Majesty [King George IV] was born, the first stone will be laid of a New Town to be called Perth. By 1830, Perth consisted of around twenty small wooden houses. Most children were educated at home, if at all, but Ellen was determined to see the development of schools in the settlement. She played a major role in the management of the Anglican Sunday School in Perth and, with a growing family of her own, was especially interested in the education of girls. 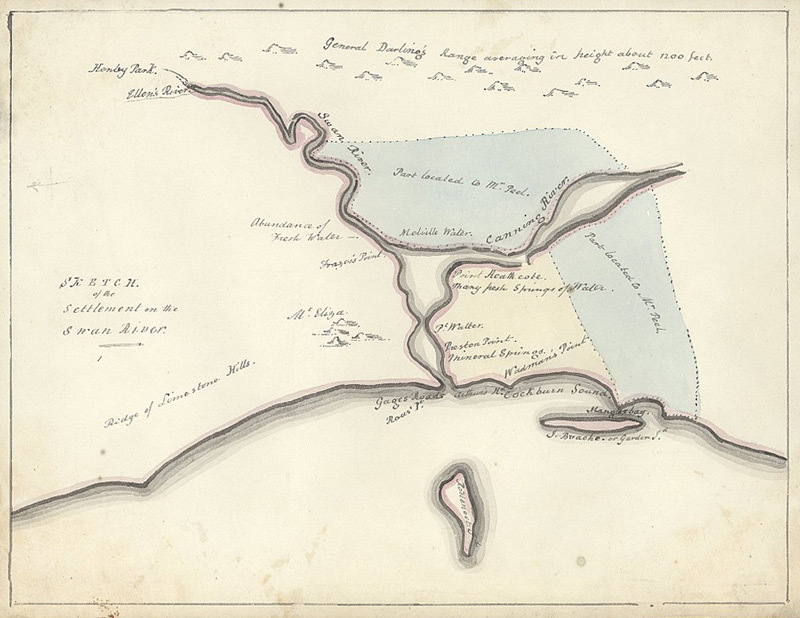 Sketch of the settlement on the Swan River, 1830. In this isolated community, Ellen also supported the sick and bereaved through regular visits and provided comfort to women experiencing homesickness in the new colony. Her generosity and ‘pleasingly natural’ character set others at ease and helped soften the opinion of those critical of her husband’s performance. Ellen spent just under eight years living in Western Australia. While she enjoyed her role as Governor’s wife, she herself struggled with the isolation and longed to see her family. She was openly relieved when her husband finally received approval of his resignation 1838. After saying their farewells, the Stirling family set sail from Fremantle on 6 January 1839, on course for Woodbridge. Ellen passed away at Woodbridge in 1874. She was buried alongside her husband in the grounds of Stoke Church, the place they had married over fifty years earlier.